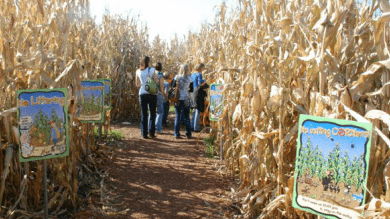 Govin’s features three full acres of pick-your-own pumpkin patch. The big orange fruits come in all shapes and sizes from 1 to 200 pounds. (Cool side note: to help the pumpkin pollination, they rent bees from a local honey producer.) Pre-picked pumpkins available. The patch includes restrooms and tractor-pulled hay rides. You’ll also find a variety of produce and grass-fed/range-fed meats.